One of Joanne’s Christmas recipes from this book can be found after our review. Details at the end of this post on how to enter to win a copy of Christmas Cake Murder along with a link to purchase the book from Amazon, and an indie bookstore where a portion of the sale goes to help support KRL. Before Hannah Swensen baked mouthwatering treats out of Lake Eden’s premier bakery The Cookie Jar, before she dated both Norm and Mike, and before she finally married only to discover that her husband… Before all of this, Hannah was a graduate student who returned to her hometown following the death of her beloved father. Hannah and her two sisters were at a loss on how to pull their mother out of her understandable depression, but Grandma Knudson knew exactly how to nudge Delores out of bed and back into her normal domineering role. Essie Granger recently fell and broke her hip, and the always helpful Delores can be counted on to rally the forces and cheer up the woman as she recuperates in the hospital. Essie and her husband lived in and ran the Albion Hotel until it fell into disrepair, so Delores asks Hannah to take her there to pick personal items for Essie during her hospital stay. Among the knickknacks Hannah discovers a stack of notebooks, where Essie seemed to have begun writing a compelling tale of a young woman fleeing for her life and escaping on a bus to Brooklyn. Delores, Hannah, and her sisters soon become immersed in the adventures of the woman forging a new life in a strange city even as they themselves find themselves forging new paths themselves. The investments made by their father have given them the means to achieving their goals, which for Hannah means abandoning heartbreak and college for her dream of opening a bakery and café. 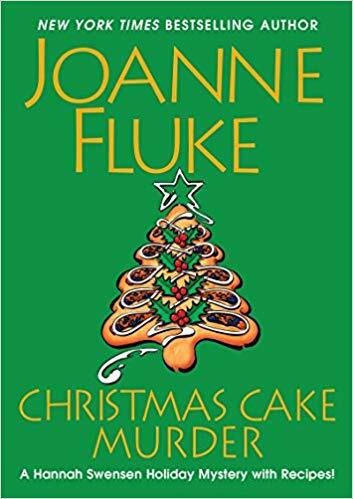 It is Delores who pushes Hannah into making the first step towards opening The Cookie Jar Bakery, with some of the first delicacies being recreations the Albion’s inaugural Christmas Ball Christmas Cake Parade. When not discovering the secret ingredients to perfecting the colorful festive pastries, Hannah will unravel the mystery behind Essie’s notebooks and whether they were truth or fiction. This is a delightful palette cleanser for readers anxiously awaiting for the next installment of the Hannah Swensen mysteries. Both they and Hannah were left reeling with shock following the events of Raspberry Danish Murder, but this novel takes a breather by going back in time to the start of her life as a professional baker. New readers can jump right into this long-running series, while faithful fans will find themselves appeased with an abundance of delicious recipes, elaborate cooking descriptions, and the good-natured humor of the Swensen women. This is the perfect heart-warming novel for the holiday season, one that is light on danger but full of emotional moments for those dealing with loss through the support of love and friendship. DO NOT preheat oven—dough must chill before baking. Melt the butter in a microwave-safe bowl or in a saucepan on the stovetop. Add the cup of powdered sugar and the half cup of granulated sugar and mix thoroughly. Let the mixture cool to room temperature. Mix in the egg and the peppermint extract. Add the baking soda, cream of tartar, and salt. Mix until everything is well combined. When you’re ready to bake, preheat oven to 325 degrees F. with the rack in the middle position. While your oven is preheating, either spray your cookie sheet(s) with Pam or another nonstick cooking spray or line them with parchment paper. Add the red decorator’s sugar to one bowl of white sugar and mix it in with a fork from your silverware drawer. Add the green decorator’s sugar to the other bowl of white sugar and mix it in. Use your impeccably clean hands to roll the dough into walnut-size balls. Roll half of the dough balls in the bowl of red and white sugar. Roll the second half of the dough balls in the bowl of green and white sugar. Place the sugar-coated dough balls on a cookie sheet, 12 to a standard-size sheet. Unwrap the Hershey’s Kisses and place one, point up, on top of each sugared dough ball. Press it down so that it will stay in place. Bake your Minty Dream Cookies at 325 degrees F. for 10 to 15 minutes. (The cookies should have a tinge of gold on the top.) Cool the cookies on the cookie sheet for 2 minutes, then remove them to a wire rack to finish cooling. Hannah’s Note: If you used parchment paper to line your cookie sheet, just pull the paper, cookies and all, over to a wire rack. Yield: Approximately 5 dozen crunchy, buttery, sugary peppermint and chocolate cookies. To enter to win a copy of Christmas Cake Murder, simply email KRL at krlcontests@gmail[dot]com by replacing the [dot] with a period, and with the subject line “christmas cake,” or comment on this article. A winner will be chosen December 8, 2018. U.S. residents only. If entering via email please include your mailing address (so if you win we can get the book sent right out to you), and if via comment please include your email address. You can read our privacy statement here if you like. Thank you so much for this giveaway. I have always enjoyed this series. I’m one of those people that likes Christmas cake and the cookies sound delicious too. Thanks for the chance to win Christmas Cake Murder! I love the Hannah Swensen series. Thanks for the chance. Thanks for the chance to win. I love this series! Thank you for the chance. I love Joanne Fluke! I have only read one other in this series. This sounds like a good opportunity to see her backstory. I can never get enough of these books. I am definitely a Hannah-maniac! I’m anxiously waiting my turn to get to the top of the reserve list at the library. I’ve also enjoyed trying some of the recipes. Joanne Fluke is my favorite author! You can never go wrong with a read of one hers. Great choice for a giveaway! Thanks! Yummy yummy yummy..both the recipes and the writing! Would love to win a copy. Especially if it was autographed? Love this series and the recipes! I love the books by Joanne. The recipes are so good too. Thanks so much for the chance to win this book. I enjoy reading all the books by this author. One of my favorite series. 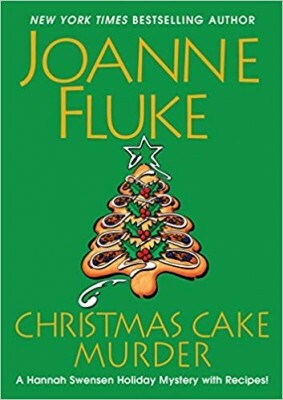 Looking forward to reading “Christmas Cake Murder”. Where is the recipe for Christmas Cake? It’s why I bought the book!